Are There Medications for Panic Attacks? Anxiety disorders affect around 40 million American adults in a given year. Unlike the occasional nervous feelings that subside after a while, anxiety disorders last at least six months. Anxiety is described as the overwhelming, persistent feelings of worry, often when there is no real threat provoking these feelings. There are many types of anxiety disorders, which include generalized anxiety disorder, panic disorder, and social phobia. Panic disorder is characterized by attacks that can last anywhere from five minutes to half an hour. Fortunately, there are certain medications for panic attacks. Panic attacks are characterized by intense feelings of fear and anxiety that come on suddenly. They are typically accompanied with physical symptoms like trembling, difficulty breathing, muscle tension, rapid heartbeat, dizziness, and sweating. Panic attacks usually last between five and thirty minutes, but can be very dangerous if they occur while driving or operating any other heavy machinery. There are several triggers that can lead to a panic attack, including excessive stress, a traumatic event (i.e., a car accident or witnessing a crime), genetic predisposition, poor diet, and keeping an inactive lifestyle. 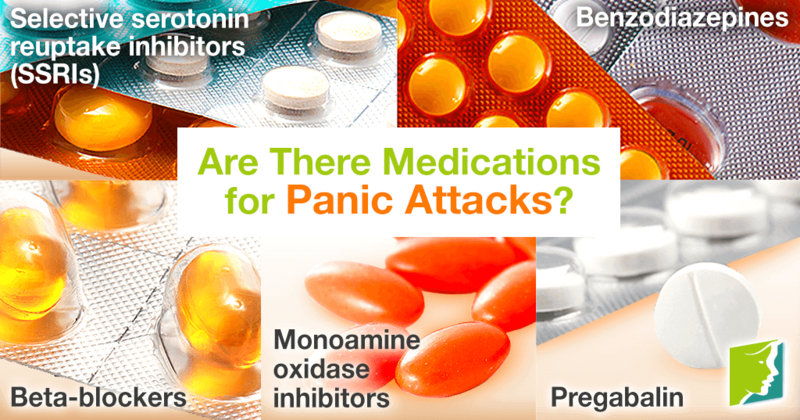 Medications for panic attacks help control symptoms and reduce the frequency and severity of panic attacks. These are usually the first choice when treating panic attacks because they are generally safe and have low risk of serious side effects. SSRIs are a type of antidepressant that helps balance brain chemicals (neurotransmitters) by making more serotonin available. Fluoxetine, paroxetine, and sertraline are commonly prescribed SSRIs. These anti-anxiety medications start working quickly and are typically used to treat general anxiety disorders, panic disorders, and social phobia. They have a sedative effect on the nervous system. Clonazepam, lorazepam, and alprazolam are generic medications that fall into the category of benzodiazepines. Beta-blockers work to control physical symptoms of panic attacks, like trembling and rapid heartbeat. Beta-blockers can also be prescribed for heart conditions, like high blood pressure. They are generally used for a short period of time. These help relieve anxiety symptoms by balancing neurotransmitter levels. This is a type of anticonvulsant that is also used to treat epilepsy. It is beneficial when treating panic attacks because of its sedative effect. Panic attacks are characterized by intense feelings of fear and anxiety that come on suddenly, and usually cause symptoms like sweating, trembling, and rapid heartbeat. Medications like benzodiazepines and SSRIs have been known to be helpful in treating panic attacks. In addition to these medications for treating panic attacks, it is recommended to see a doctor and try psychotherapy as an option. The combination of therapy and medications has been known to be the most effective treatment for panic attacks. Having a panic attack is an overwhelming and frightening experience and is often a symptom of an underlying panic disorder. Read all about four herbal cures for menopausal panic disorder that can help you relax your way to recovery here. Long-lasting relief can start today!